Opossums are the only marsupials found in North America. They live in many parts of the U.S., with the exception of the Rockies, western plains and parts of the northern U.S. Opossums usually live alone and are only active at night. Opossums usually have two to three litters per year, with an average of seven young in each litter. Like other marsupials, the young spend their first several weeks of life in their mother’s pouch. 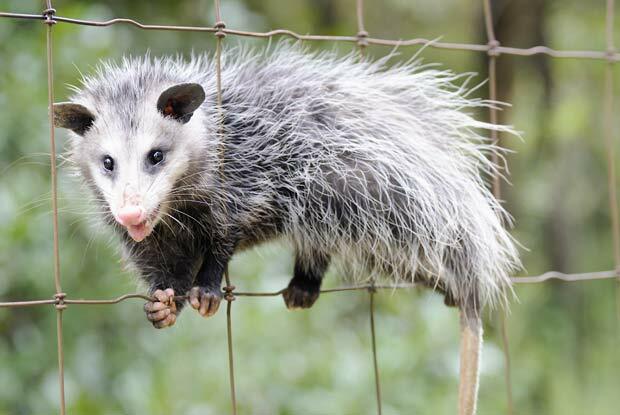 Opossums generally eat fruit, grains and insects, but will also eat out of compost piles, garbage cans and pet food dishes if they can get access. Opossums prefer environments near streams or swamps, but can live in diverse areas, ranging from arid to moist, wooded to open fields. They take shelter in burrows of other animals, tree cavities and brush piles. Opossums sometimes den in attics and garages where they may make a messy nest. They can also destroy poultry, game birds and their nests. When startled, opossums can bare their sharp teeth and hiss, and in rare cases may bite if they feel threatened.